You can tell Denis Shapovalov is a man in a hurry. In a hurry to finish the point, to finish the match, to scale the high peaks of world tennis. Running at full throttle, hitting at full throttle, he has brought a breathless energy to the game. 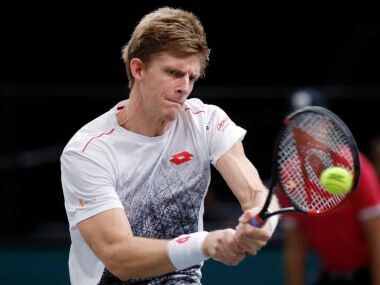 His booming game reverberated in the indoor stadium of the Northlands Coliseum, Edmonton as he scored a 6-3, 7-6(1), 6-3 over Ramkumar Ramanathan on Sunday. 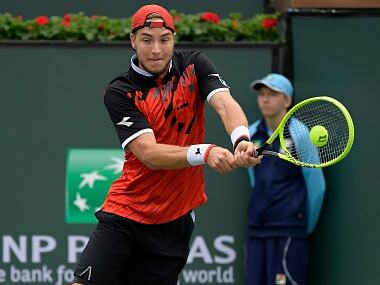 Shapovalov’s win in the first of the reverse singles saw Canada take an unbeatable 3-1 lead over India and help his team back into the 16-team Davis Cup World Group, which they have been a part of since 2012. India’s Yuki Bhambri won the dead fifth rubber, scoring a 6-4, 4-6, 6-4 win over Brayden Schnur. 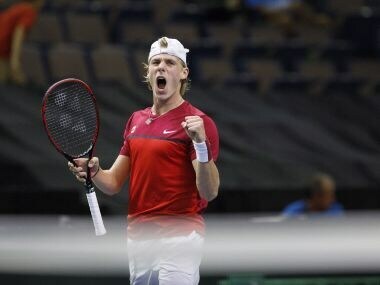 The 18-year-old Shapovalov, who had not won a live Davis Cup rubber until his five-set win over Bhambri on the first day of the tie, lived up to all the expectations heaped upon him and celebrated it by taking a lap of honour around the court while waving a giant Canadian flag. There was as much sense of redemption, as relief, as Shapovalov had played a part in his team dropping to the play-offs this year. During the first round against Great Britain in February, Canada had to default the tie in the deciding fifth rubber when Shapovalov accidentally hit the chair umpire in the eye after a disputed line call. That incidence seemed to temper the Canadian, who has since made rapid strides on the pro circuit. Given Shapovalov’s incredible run this summer, it is easy to forget that he had won the boys’ title at Wimbledon only last year. In just one year of apprenticeship, however, Shapovalov seems ready to go toe to toe with the best in the world. Having started the year at 250 in the world, Shapovalov has already climbed to No 51. He is on a learning curve and took a valuable lesson from being pushed to five sets by Bhambri on Friday. “I learnt that I don't want to go to the limit ever again,” Shapovalov said. And he started off in a rush against Ramkumar on Sunday, winning the first 11 points and quickly racking up a 3-0 lead. It was a match-up between the No 1 players from the respective teams, but with Ramkumar ranked 154, it wasn’t quite a match on paper. The Indian, 22, had done well to subdue Davis Cup debutant Schnur in the first singles, but he struggled to keep pace with Shapovalov. 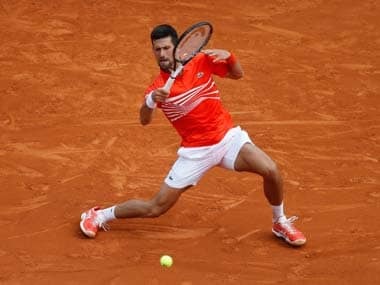 His lefty game already makes things a little complicated for his opponents, and the top spin he generates on the serve and the forehand isn’t easy to negotiate. More so since Edmonton lies at an altitude of more than 2000 feet, making the ball jump. The Indian, who usually likes to tee off on his forehands, just wasn’t getting the time to set up his shots. Once he had fallen behind in the first set, and with the Canadian coming out so hot off the blocks, Ramkumar couldn’t quite catch up. The Indian had one winner to his name and five unforced errors as Shapovalov wrapped up the first set in 33 minutes. But by the end of the opening set, Ramkumar was getting into his serving groove. He brought some hustle to the court, rushing to the net occasionally to throw his young rival off. The Indian camp, however, knew all along that the match that the Canadian was going to live or die by his shot-making. Shapovalov leaps high for his groundstrokes and looks to clobber every ball at a million miles per hour. The exaggerated swing and flourish is part of the Shapovalov excitement. 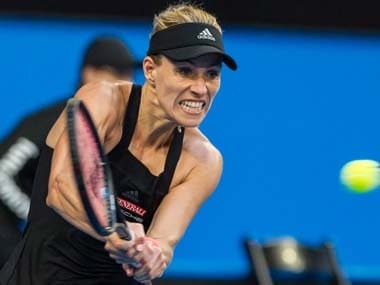 But there was a bracket of play in the second set when the Canadian over-hit the ball regularly, didn’t put enough returns in and even started taking wild swings at the volley, erring on six of the nine net points. As Ramkumar settled down into the match and held on gamely to his serve, the errors (28 in total in the second set) started stacking up for Shapovalov. Patience is a virtue he’s still to learn. And it was apparent in the 12th game, when he served to stay in the set at 5-6. Having played Ramkumar out of the court, Shapovalov failed to put away the forehand winners on three successive points to stare at a triple break point. That seemed to shock him out of the bungling reverie. Shapovalov saved the first one with a smash volley and came up with two clutch first serves to set up the next two points. At deuce, Ramkumar placed a return in and rushed to the net, forcing Shapovalov to make a difficult backhand pass, which he pulled wide. The Canadian served an ace to bring it back to deuce, and this time when Ramkumar once again attacked the second serve and darted to the net, he swung the forehand inside out to make the perfect pass. That done, Shapovalov once again wrested command of the match. He was smooth and assured in the tie-break, winning it 7-1. As if the opponent across the net was not trouble enough, Ramkumar decided to make enemies with the small but noisy Canadian crowd and the umpire. The Indian saved a break point in the fourth game, blocking a volley back with the deftest of touches and then brought his index finger to his lips to shush the home supporters. He repeated the act as he won two more points to close out the game. In his next service game, at 0-30 down, when he got into a protracted (and unnecessary) argument with the chair umpire over a line call. It seemed to distract him completely from the already impossible task at hand, and Ramkumar lost six points in a row, starting with two on his own serve when he failed to put away two backhand volleys. Shapovalov gladly received the gift, and embellished it with the point of the match in the very next game. He backtracked to a lob by Ramkumar, spun around and whipped a forehand that just dipped into the diagonal corner. His high-risk game comes with high rewards. Shapovalov rode that wave, serving out the match at 6-3 in two hours and five minutes. “I grew up wanting to represent my country, to play Davis Cup… always wanted to be part of the team. To be able to clinch today, honestly, it’s the best feeling,” said the teen, having led his team to the World Group. It is yet another stop on his express elevator to success.